Think of the last time you screamed. Chances are you attracted someone’s attention. What about the last time someone flirted with you? You were likely more selective in your response. New research findings from Arizona State University and the University of Veterinary Medicine Hannover in Germany demonstrate that a less social species – the grey-mouse lemur – pays attention to alarm calls regardless of whom they emanate from, but they are selective when it comes to mating calls from their fathers, paying more attention to calls from unrelated males. 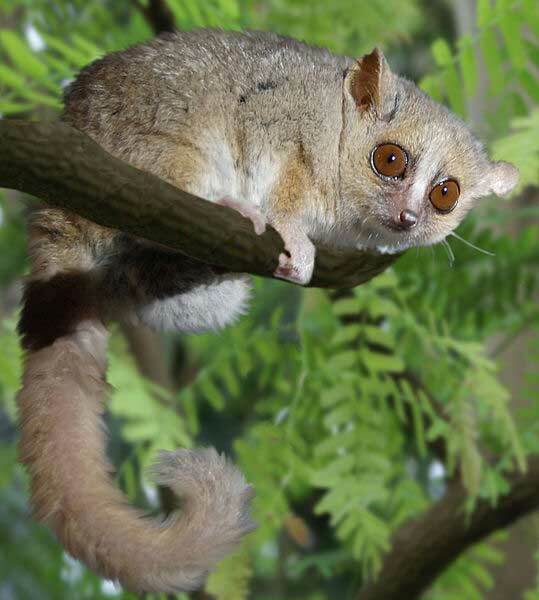 Findings from the study that analyzed grey-mouse lemur calls provide the first evidence of paternal kin recognition through vocalizations in a small-brained, solitary foraging mammal, said Sharon Kessler, the principal investigator for the study and ASU School of Human Evolution and Social Change graduate student. Grey-mouse lemurs serve as a model for the early primates from which humans evolved, she added. Early primates likely shared traits with the lemurs such as foraging in dense forests and hunting for food at night in solitude, but also engaging with each other in social groups. The research indicates that sounds made by animals have been a vital tool to recognize kin since before complex social systems evolved in primates, “basically since the origins of primates,” Kessler said. Studying an animal that forages in solitude, and not in groups like monkeys and apes, allowed researchers to model how important kin recognition through voice would have been in a similar species from 55 to 90 million years ago. Findings will be published online Friday, Nov. 30, in BMC Ecology. “It suggests that the paternal kin recognition can evolve without having a complex social system,” Kessler said. The research team’s work began in 2008 to examine whether or not animals with smaller brains relative to body size could recognize kin through vocalizations as they forage by themselves at night. Calls were measured through frequency (how high or low the voice is) at various time points in the call, duration and intersyllable interval (how rapidly the call is repeated). “Vocalizations are particularly important because you can communicate over a distance,” Kessler said. But danger sometimes lurks in the form of predators that may hear the calls. Mouse lemurs can communicate in the high frequency and ultrasonic ranges that are too high for humans to hear. This is also too high for predators like owls to hear, meaning that that mouse lemurs can communicate without being eavesdropped by predators. Findings of the study showed that females distinguished their fathers from unrelated males using mating calls. One explanation for being able to recognize paternal kin may be that females can use the calls to avoid mating with relatives, Kessler said. It’s compelling to consider how mouse lemurs distinguish the calls since the species is raised only by mothers, aunts and grandmothers, she added. Fathers don’t help with infant care and don’t share the nest with the mother and babies, so learning a father’s voice while growing up doesn’t seem possible. One possibility is phenotype matching. If family members sound similar, females may compare calls of potential mates to their own calls and to the calls of their brothers (littermates) in the nest. Then if they choose mates that sound different from themselves and their brothers, they would be choosing unrelated males.